Once assessment results have been uploaded into SchoolCity, either by scanning, GradeCam™, or online administration, the data can be viewed in a variety of ways. 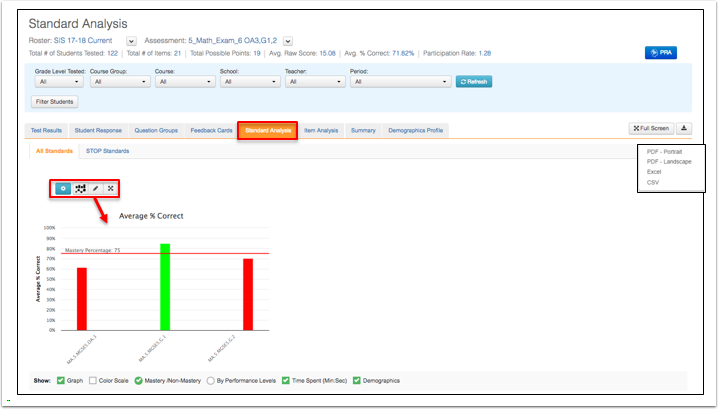 One of the Predefined Reports in SchoolCity SUITE is the Standard Analysis report. 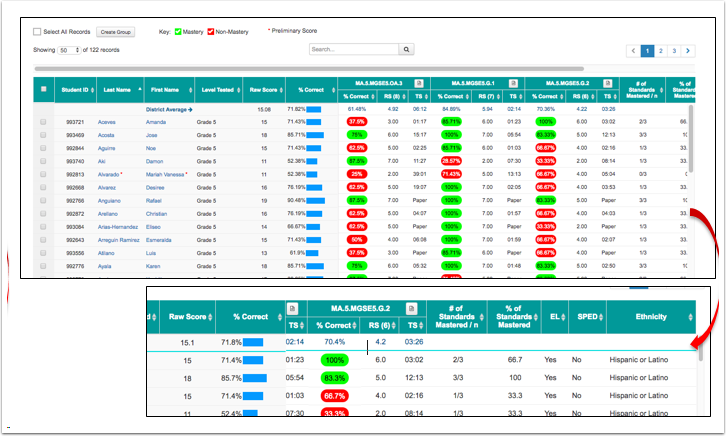 The Standard Analysis Report displays student level data by individual standard for the selected assessment. It also includes personalized resources that can be assigned to students for re-teaching, extra practice, or extension. In the Top Menu Bar, click the grid icon (or current module name) to open the navigation grid menu and select Reports. Please see the Help document,Basic Navigation: Navigating the Launchpad 6.0, for more information. The default setting shows the list of Predefined Reports under the orange tab. Click on the Standard Analysis name in blue or on the view icon (eye) to the far right to go to the Standard Analysis Report. Note the descriptor statement for this report. Or, from the Launchpad, click on the REPORTS flip card. On the flipped side, select Predefined Reports. Click on Standard Analysis to go to the report. Note: District level user shown. Change Roster: Click the down arrow to select a different roster year. Change Assessment: Click the down arrow to select a different assessment. Search Filters: Search filters depend on User role. Click Refresh after making selections. 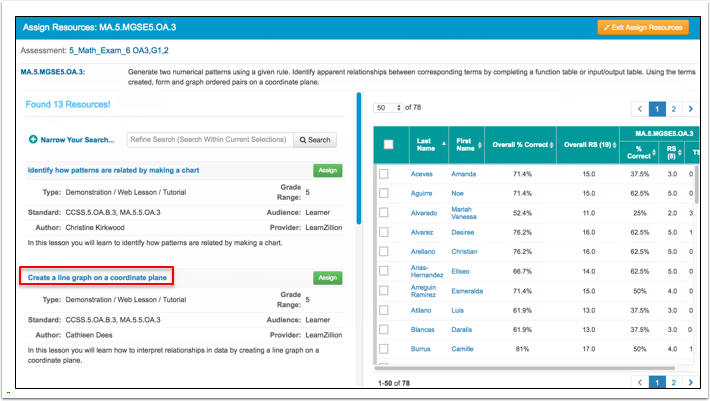 Filter Students: Click here to view data for student groups or demographic groups. Download icon: Export report to PDF (2 layouts), Excel, or CSV format. Chart Settings, Chart Type, Edit Chart Labels, Chart Full Screen: Various charts are available. Time Spent: Show or hide the time students spent on items for each standard. Create Group: Create a student group based on the results of the report. Please see the Help document, Groups: Creating a Student Group, for more information. Key: Mastery/Non-Mastery or Performance Levels: Each acts as a filter. Click on one level to show only those results below. Preliminary Score:If set to ON in District Defaults, when a score is incomplete due to unscored CR/WP items, a red asterisk will display next to the student’s name. Student Search Box: Enter a student’s last or first name and click on the magnifying glass to view results for that student. Student results: ID #, Name, Level Tested, Overall Raw Score, Overall % Correct, Individual Standards results showing % Correct, Raw Score (RS) with number of items, and Time Spent (TS). Continuation of student results: Scroll to the right to see # Standards Mastered on this assessment, % Standards Mastered, and Demographic information. PRA: View the PRA(s) assigned for the assessment and view student results. Mastery/Non-Mastery without the Color Scale, scores at or above the Standards Mastery Percentage will show in green, and scores below the mastery percentage will show in red (see Key). Note: If not locked by the district, the Standards Mastery Percentage and associated colors may be set in My Preferences. Mastery/Non-Mastery with the Color Scale highlights scores as a range of colors between the minimum value of 0%, the midpoint of 50%, and the maximum value of 100%. The Color Scale can be set in District Default Settings, and if not locked, can be modified in My Preferences. If allowed by District Default Settings, student scores may also be viewed as Performance Levels, shown in the Key. 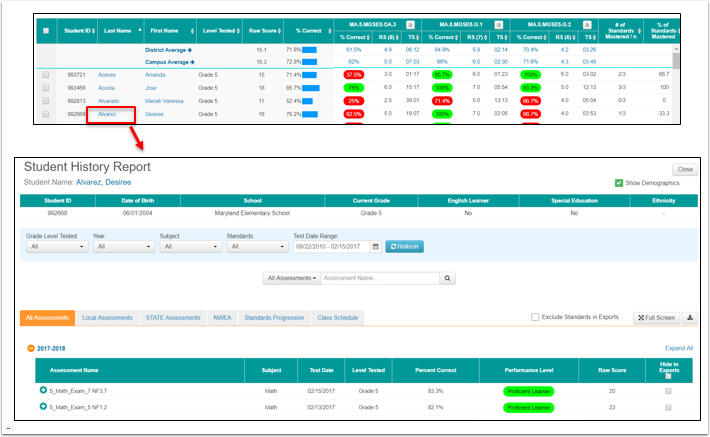 The Performance Levels, cut points, and color coding may be modified by Admin Users in District Default Settings for all other users in the district. On the far right of the User Menu Bar, click on the down arrow next to your role in parentheses. Click on My Preferences in the drop down menu. Select the Report Properties tab. If the Standards Mastery Percentage is not locked by the District, it may be set as desired. This percentage controls the Mastery/Non-Mastery results in the Standard Analysis, Standards Progression, and Objective Analysis reports. Scores at or above this value are shown as Mastery. To add theColor Scale, check the box and then set a Min Value, Midpoint, and Max Value color by clicking in the color box and selecting the desired colors. Click onSave to save any changes you have made. STOP means Scrutinize These On Performance. Click on the STOP Standards tab. A STOP standard is one in which students did not meet or exceed the Standards Mastery Percentage. In the example below, all standards on this assessment are STOP standards because at least one student scored at the Non-Mastery level for each standard. The Non-Mastery view is automatically selected and the Key shows only Non-Mastery (red). Students are listed alphabetically by default, but each column can be reordered by clicking on the column header. Note the up/down arrows in each. In the example shown, the students have been reordered from lowest to highest by Raw Score. Clicking again will reorder them from highest to lowest score. Note: Only one column can be reordered at one time. Click on the notepad icon next to the standard number. 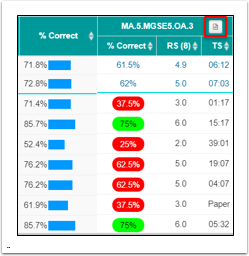 Resources for ELA and Math, aligned to the selected standard, will be displayed on the left side of the screen. These are open education resources from a variety of Open Ed providers. Note: The Resource list may vary based on current partnerships. The selected standard, student names, and scores will display on the right side of the screen. Click on the Resource Title in blue to preview the lesson. Students may be reordered from lowest score to highest score by clicking on the column header once. Click the header again to reorder from highest to lowest score. In the example below, students were reordered from lowest to highest by RS (raw score). To assign a lesson to one or more students, click on Assign to the right of the lesson title. It changes from green to orange. Check the open box next to each student who should be assigned the lesson. To select all students, check the open box in the header next to Last Name. Click on Confirm Assignment in red. A message will appear to confirm the students and assignment. Click Assign to continue. A second confirming message will appear. Click OK to continue. In the Student Portal, students can find their assignments on the MY RESOURCES Flip Card, or under the My Resources tab in the Top Menu Bar. To view the Student History report for any student on the roster in the Standard Analysis Report, click on the student’s last or first name. Please see the resource document, Reports: Student History, for more information about this report.